BJP president Amit Shah addressed a massive political rally in the heart of Kolkata on Saturday where he cornered the ruling Trinamool Congress government led by Chief Minister Mamata Banerjee over the issue of illegal immigration in India. Addressing the thousands who turned out at the BJP chief’s ‘Yuva Swabhiman Samavesh’ on a hot and humid afternoon, Shah urged the gathering to uproot the TMC government and bring BJP to power for progress, safety and security of West Bengal. Shah accused TMC of spreading falsehoods on Assam’s National Register of Citizens (NRC) and assured that the contentious move is not aimed at sending back genuine refugees but only the illegal immigrants. He said that the NRC process will be completed lawfully in Assam and Banerjee and Congress president Rahul Gandhi will not be able to stop it. Stating that illegal immigrants once used to vote for Communists, Shah said that Banerjee was once opposed to the same people she is now defending. He recalled how Banerjee protested in the Lok Sabha against illegal immigration before becoming the Chief Minister of the state. “Today they [the illegal immigrants] have become TMC vote-banks,” Shah alleged asking both the TMC chief and Congress chief to clarify whether they keep national security first or vote-bank first. At the rally held at Kolkata’s Mayo Road, the BJP chief declared that he will visit every district of West Bengal and campaign for the uprooting of the ruling government. Shah alleged that the state government had blocked every Bengali channel from airing his speech. Responding to posters of ‘BJP Go Back’, Shah countered TMC’s accusation that the saffron party was anti-Bengal. “How can we be anti-Bangla when our founder Dr Syama Prasad Mookerjee was himself a Bengali? We are not ‘Bangla-virodhi’ but we are certainly ‘Mamata-virodhi’,” Shah said. Shah also accused the Bengal government of being involved in a series of corruption cases, besides destroying the law and order situation in the state. “Since the time the Trinamool Congress government came to power in Bengal, there has been series of corruption (cases) starting from the Narada scandal, Saradha and Rose valley ponzi scams… syndicates and the unlawful activities of cattle mafias and coal mafias. In order to free Bengal from the grasp of this corruption, it is necessary to bring the Narendra Modi-led Bharatiya Janata Party in power here,” he said. “The law and order situation in the state is in shambles. Bengal is filled with the sound of bombs and bullets. Every day we get to hear about the unearthing of illegal bomb factories, gun factories,” he added. 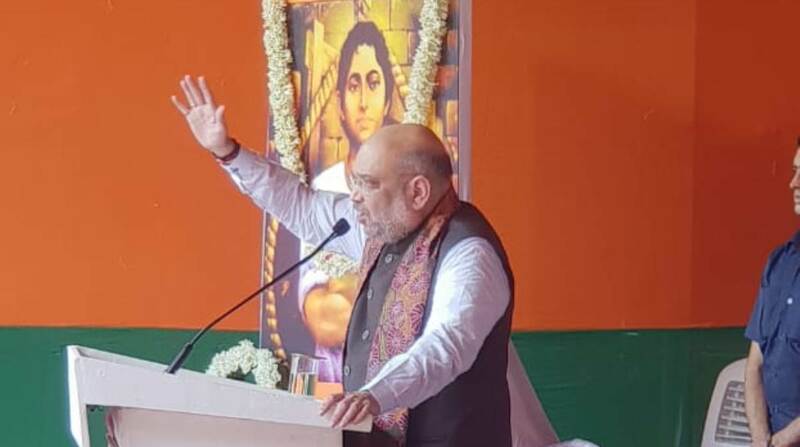 Pointing out that the Congress, Left front and Trinamool were all given a chance to run the state, Shah urged people of West Bengal to now give a chance to the saffron outfit as he promised to bring back Bengal’s glorious past. Referring to the fact that BJP is currently in power in 19 Indian states, Shah claimed the journey of his party cannot be considered complete unless it emerges victorious in West Bengal – the land of Jana Sangh founder Shyama Prasad Mukherjee and many other statesmen.